Second-year WVU medical students earned their white coats on Saturday. Dr. Clay Marsh congratulates one of the students. “There are many aspects of being a physician – few of which have to do with your wardrobe, but many of which encompass what this white coat represents – care, compassion and responsibility for yourself as a clinician and for your patients as their advocates,” Dr. Clay Marsh, vice president and executive dean of WVU Health Sciences, said. For the School’s annual John W. Traubert White Coat Ceremony, each coat is sponsored by an alumnus of the school, and a note of encouragement from the sponsor is placed in a pocket of the coat for the student. At WVU, the first White Coat Ceremony was held Jan. 26, 1996. Its tradition differs from the conventional concept in that it honors second-year students and marks the transition from basic sciences to clinical sciences, from reading about illness and disease to diagnosing it, and from learning about treatments to prescribing them. The ceremony stresses the importance of the doctor-patient relationship and the relevance of the white coat as a cloak of compassion. Five students in the class are legacy students. The Arnold P. Gold Foundation designed the White Coat Ceremony in 1993 to welcome entering medical students and help them to establish a psychological contract for the practice of medicine. The event emphasizes the importance of compassionate care for the patient as well as scientific proficiency. It has since been established at medical schools across the country. WVU’s ceremony was named for Dr. John W. Traubert, former associate dean for student and curricular affairs at the WVU School of Medicine, who practiced family medicine in Wellsburg before joining the WVU faculty as founding chair of the Department of Family Practice, now the Department of Family Medicine. • Jane Tuttle, a Paden City native with undergraduate degrees in professional writing and biology, will attend classes on the WVU Charleston Campus next year. • Bridgeport native Brooke Cottrill hopes to specialize in child and adolescent psychiatry. • Sundas Lateef of Morgantown was inspired to become a physician by watching her mother interact with patients and community members. • Ashlee Seldomridge, an alumnus of the School of Medicine’s Exercise Physiology program, completed a fellowship at the National Cancer Institute before joining the M.D. program. 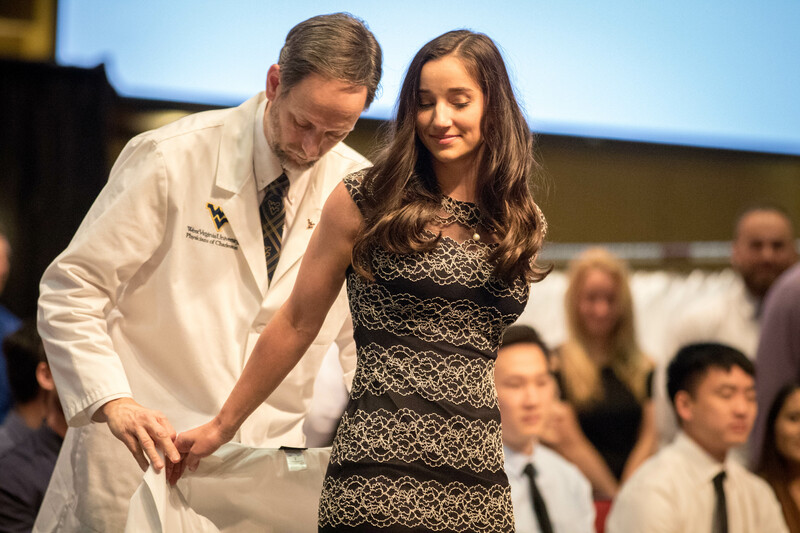 Second-year WVU medical students earned their white coats on Saturday.